Acupuncture is an ancient traditional Chinese medicine which focuses on balancing energy pathways in the body to promote optimal health. According to this theory, an imbalance of these forces promotes disease by blocking pathways, or meridians, that allow the unrestricted flow of vital energy, or qi, throughout your body. Acupuncture aims to unblock your vital energy flow by targeting specific points on your body related to these meridians. Acupuncture improves the body’s functions and promotes the natural self-healing process by stimulating specific anatomic sites, commonly referred to as acupuncture points, or acupoints. The most common method used to stimulate acupoints is the insertion of fine, sterile needles into the skin. Pressure, heat, or electrical stimulation may further enhance the effects. Acupuncture points are thought to have certain electrical properties, which affect chemical neurotransmitters in the body. 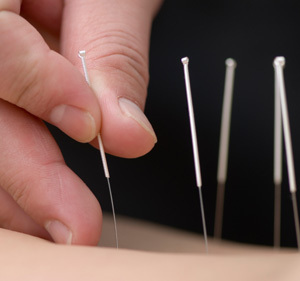 According to theories of traditional Chinese medicine, the human body has more than 2,000 acupuncture points connected via pathways or meridians. These pathways create an energy flow through the body, known as Qi, that is responsible for overall health. Disruption of the energy flow can cause disease. Acupuncture aims to correct these imbalances when applied at acupuncture points and improve the flow of Qi. Acupuncture points are believed to stimulate the central nervous system, which, in turn, releases chemicals into the muscles, spinal cord, and brain. These chemicals either alter the experience of pain or release other chemicals that influence the body’s self-regulating systems. These biochemical changes may stimulate the body’s natural healing abilities and promote physical and emotional well-being. Modern research has demonstrated acupuncture’s effects on the nervous system, endocrine and immune systems, cardiovascular system and digestive system. By stimulating the body’s various systems, acupuncture can help to resolve pain, and improve sleep, digestive function, and sense of well-being.